enjoy the slow life on the island with kayaking, fishing, golfing and trying new things..health is something of concern as i do have a brain tumor which opens my eyes to enjoy life to the fullest..my wife mindy does a fair bet of sewing on the island from alterations to wedding dresses to creating special program called PEI angel dresses and making curtains for our bus...my passion is our bus conversion. 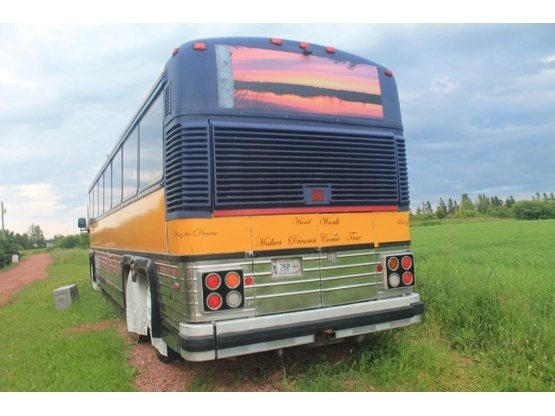 MCI 102C3 Bus Rv Conversion. Big, Yellow, Black and Shiny Stainless. Super nice couple, hope to see them again. What a great couple. 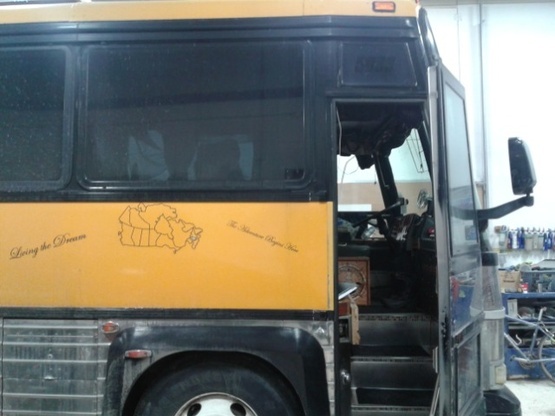 They stopped in on a very cold November night with their beautiful MCI bus conversion. We had a space indoors for them, and almost had to force them to not stay out in the cold. A loving couple with a spectacular outlook on life. If you get a stay request from them do yourself a favor and accept it, you will be happy you did. We enjoyed our walk along the shore in front of Doug and Mindy’s beautiful water front property. They were very friendly and accommodating. We were given a interesting tour of their bus conversion project. They’ve gone all out getting this bus ready for it’s maiden tour. Great place to stay highly recommended. Mindy and Doug were fantastic hosts. Very accommodating and welcoming. Beautiful property. They were as nice as could be- so welcoming and kind. And generous! Great location and the sunset on the river was spectacular. We had a wonderful overnight stay.